Welcome to Cold Start! AWS Serverless Application repository, nanoservices, and the future of building applications on AWS. Welcome to the first release of Cold Start! This week ServerlessOps is excited about the recent general availability of AWS Serverless Application repository. We see this as a great leap towards using nanoservices to compose functional applications. And we're not the only ones! Remember to visit our blog tomorrow. We'll discuss our thoughts on nanoservices, composing applications, and even show what we've released and how it helped us reach these opinions on the future of building applications. 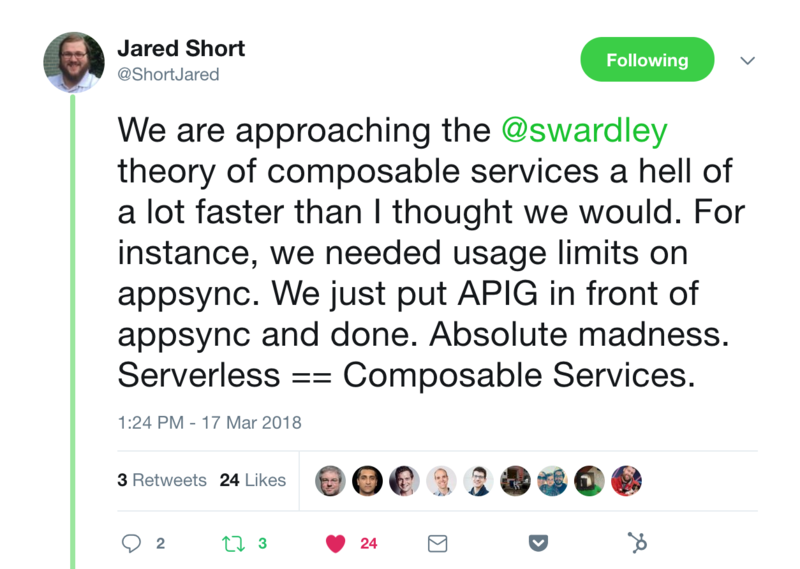 This Simon Wardley piece is a must read for anyone interested in why serverless will be transformative. Best of all there's this quote. "it encourages far greater levels of re-use. One of the problems with the old object orientated world was there was no effective communication mechanism to expose what had been built. You’d often find duplication of objects and functions within a single company let alone between companies. Again, exposing as web services encourages this to change. That assumes someone has the sense to build a discovery mechanism such as a service register." Mike Roberts of Symphonia takes us through using AWS Serverless Application Repository. Haven't tried the service out yet? This is everything you need to get started. Interested in building Serverless applications on AWS? James Hood and Salman Paracha show how to build and deploy one. Pay careful attention to James and his aws-serverless-twitter-event-source service. Have ideas on how to reuse it to create a new application? In the course of our recent work, we chatted with Will Hamill and had a great discussion about being able to search for reusable infrastructure and domain logic just like we browse Github, NPM, PyPi, and etc. for software today. His post re:Invent blog post gives a good means of understanding the reasoning behind what we see out of AWS. Did you enjoy this newsletter? Not a subscriber already? Well signup to have this delivered to your inbox each week!